Has this ever happened to you? You invent a new drink, and you think it’s the greatest thing ever. You sweat over a good name, you brag about it to all your friends. And then you forget about it. You remember a few months later, and try it again, and cannot imagine what lead you to think it was a great drink. Happily, this is not the case with the Campari Dolce. I invented this drink at a Thursday Drink Night in October. The ingredient for the night was honey mix. I wanted to balance the sweetness with a good dose of bitterness, and had just started experimenting with Campari, so it seemed a natural ingredient to try. I decided to use gin as my base, and some orange bitters to add depth. It was one of those drinks that came together naturally. I was of course happy when the other participants that night seemed to like it, and even happier when it was declared the winning drink for the night. In my never ending quest to try new drinks, the Campari Dolce fell off my radar until last night. I thought I would try it again, and see how my old friend was. I was delighted to discover I still really like the drink! Stir ingredients over ice for 30 seconds or more, strain into cocktail glass. Garnish with brandied cherries. Honey mix is one part honey to one part water. Heat over low heat until they mix, then store in the fridge. This makes the honey far more mixable than straight. 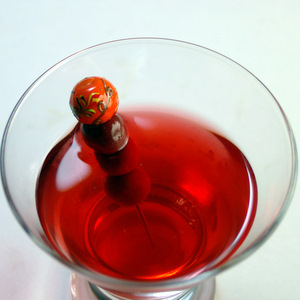 At the original TDN, I offered up a slight variation for those who are still intimidated by the bitterness of Campari. Have any drinks you invented stood the test of time? Great cocktail! It worth to try! We do love the Campari. Have to give this one a try! This looks fwesh! If you had to do without the citrus-based bitters, what might you add instead? Good question, Tom. I think a lot of bitters, especially aromatic bitters, use a bit of citrus peel for flavoring. I think the drink would be fine without bitters, given the complexity you already have in the Campari. Cherry bitters might be a nice addition. You had me worried a second there (and definitely nodding) at that first paragraph. This is still a delightful cocktail; I’ll have to give your variation a try Stevi. Once I hit publish, I felt I should stick with it. The Campari Dolce is one of the few TDN drinks I’ve added to my recipe list, and every now and then my eyes will fall on it and I’ll make myself one. It has a surprising and enjoyable taste.